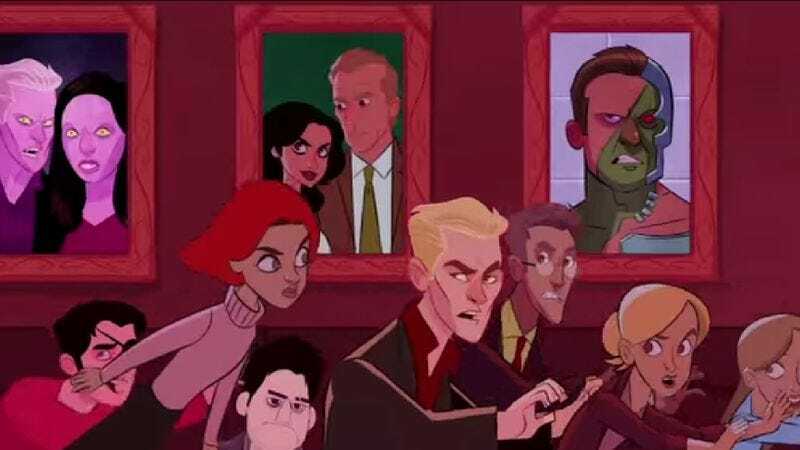 Having previously given the world a terrific look into at what Doctor Who would be like as a Saturday morning cartoon, artist Stephen Bryne has moved on to Buffy The Vampire Slayer, carving out a niche as the guy who makes intros to imaginary cartoons the world deserves but never got. Bryne, clearly full to bursting with affection for the show, has packed his intro with nods to Buffy’s history, from Willow’s changing hair color to visits from ghostly versions of Tara and Anya to a glimpse of a world full of shrimp. The character designs are incredibly charming, and the wild adventures the Scooby gang never got to go on make us wistful for the actual animated Buffy series that was developed years ago but never happened. With stuff like this under his belt, we’ll be on the lookout for anything else Bryne does in the future—perhaps an animated version of Game Of Thrones, or he could go the other way and make live-action intros for Futurama or The Venture Brothers.